Despite the political rhetoric and public outcry following the Panama Papers scandal, a new report shows the current EU anti-money laundering regime does not prevent corrupt money from flowing through Europe's financial centers, Sputnik has been told. 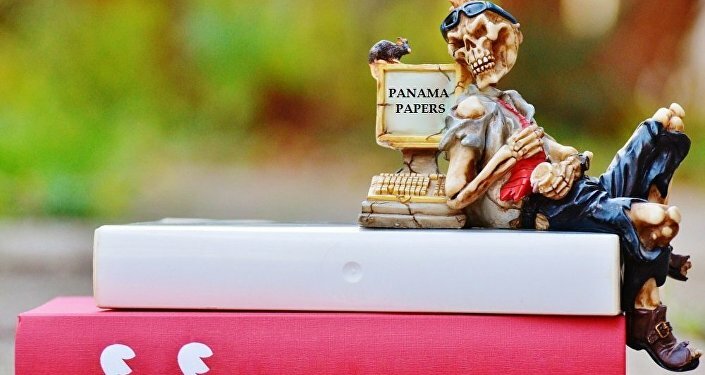 The Panama Papers affair was the result of painstaking work by International Consortium of Investigative Journalists, who released more than 11.5 million financial and legal records exposing a system that enables crime, corruption and wrongdoing, hidden by secretive offshore companies. ​Despite the leaks and the outrage that follows, a new report from Transparency International has found that — notwithstanding a lot of political rhetoric — the current EU anti-money laundering regime does not prevent corrupt money from flowing through Europe's financial centers. An activist takes part in a demonstration outside the European Commission (EC) headquarters ahead of statements by the EC on the effectiveness of existing measures against tax evasion and money-laundering in light of the recent Panama Paper revelations, in Brussels, Belgium, April 12, 2016. The campaign group says that EU Member States have "firmly ruled out" public access to the identities of those who control and own shell companies, otherwise known as beneficial owners, in the current negotiations around reforming EU anti-money laundering legislation. These companies and other corporate vehicles were implicated in the money laundering scandals exposed by the Panama Papers. "We've had the scandals, we've had the talk, now it's time for action. Not only do we need better enforcement but we also need better rules. It seems member states are already suffering from amnesia one year after the Panama Papers," Laure Brillaud, Policy Officer for Anti-Money Laundering at Transparency International EU told Sputnik. ​Tweet: "Dodging tax is a huge business. European legislation can end mailbox companies." "By denying the public access to the identities of who owns shell companies EU member states are allowing a shadow world of ownership and control to flourish," she said. Transparency International EU is calling for full public access for all companies and trusts operating or doing business on EU territory even when they are not based in the EU, in order to crack down on the use of extraterritorial secrecy jurisdictions such as Panama or the Bahamas. The report also expresses concerns about "nominees" whom can be misused as frontmen by corrupt individuals as shown by the Panama Papers. It recommends strengthening regulations by requiring nominees to be licensed and to disclose the identity of the person who appointed them. The study found significant problems with professional bodies not doing their jobs on reporting suspicious activities to public authorities. Particularly with non-financial professions such as lawyers and notaries where reporting has been "negligible," the report says.